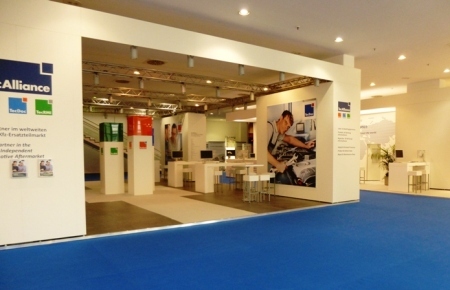 For TecAlliance the Automechanika 2014 in Frankfurt was a complete success. One year after the fusion of the three leading pan-European service providers in the automotive aftermarket – TecDoc Informations System GmbH, TecCom GmbH and AuDaCon AG as the TecRMI brand – to form TecAlliance GmbH, the company presented itself for the first time at the leading international trade fair of the automotive economy. One particular highlight was the “VIP Aftermarket Evening” that was held together with the German auto part trade association GVA on 16 September 2014. More than 400 invited guests celebrated the tenth anniversary of TecRMI and the twentieth of TecDoc. Another highlight was the handover of a donation check from the automotive sector association TEILEn e.V., to the Peter Maffay Foundation. 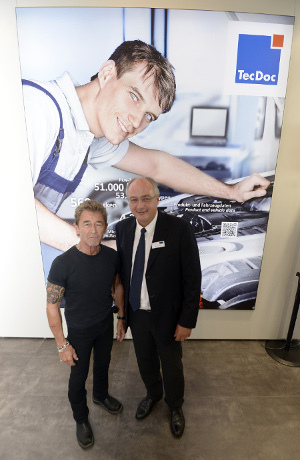 Peter Maffay, Germany’s top rock musician and the founder of the organisation, appeared personally on 19 September 2014 on the TecAlliance stand to accept the check. The prototype of the app TecAlliance MOBILE also drew great interest because it connects functions and data from TecDoc, TecCom and TecRMI. TecAlliance Managing Director Jürgen Buchert with Peter Maffay on the TecAlliance trade fair stand after giving him the donation check from TEILEn e.V. For TecAlliance customer orientation is of primary importance. That was demonstrated this year through the introduction of new modules for the repair of electronic components, expansion of the TecDoc reference data and the introduction of new filter options for vehicle search by integrating the Vehicle Identification Number (VIN Number). That the repair and maintenance specialist TecRMI continues to set the standard in workshop systems was proven by a recent study from a consulting firm. Six automotive service providers were tested for the services they offer; the result was that TecRMI was the benchmark for workshop systems in the automotive sector. Under the motto “the best from different worlds” TecAlliance presented for the first time at Automechanika the prototype of a modular, individually configurable iOS and Android app for manufacturers, traders and workshops. Stand visitors showed great interest in the TecAlliance MOBILE app that includes extensive standardised data and proven products from the TecAlliance brands TecDoc, TecCom and TecRMI; it will be available in different variants. The responses and requirements of the stand visitors will be processed so that they can flow into the development and completion of the app. Around 140,000 business visitors from 173 countries came to the leading international exhibition for the automotive economy during its five days in order to learn about new products and developments. Automechanika set a new record this year with 4,631 companies from 71 countries exhibiting; this was more than ever before. The response of the independent aftermarket to TecAlliance’s appearance at the exhibition was extremely positive. TecDoc, TecRMI and TecCom all registered very strong business development in all markets. The crowds of guests were enormous on all days and the quality of the visitors was excellent. 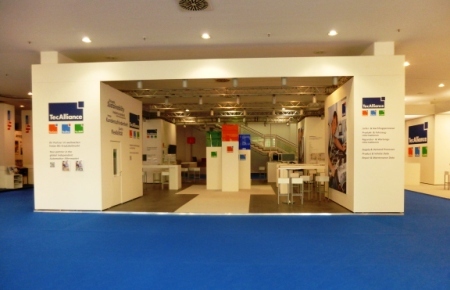 Impressions of the TecAlliance exhibition stand. 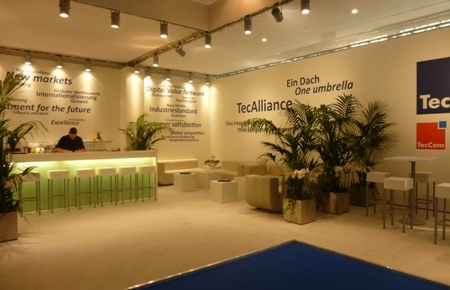 The design and architecture of the TecAlliance stand were considered particularly attractive by visitors.